Recently, growing attention has been devoted to the concept of “Open Innovation”, both in academia as well as in practice. Chesbrough, who coined the term “Open Innovation” describes in his book “Open Innovation: The New Imperative for Creating and Profiting from Technology” (2003) how companies have shifted from so-called closed innovation processes towards a more open way of innovating. 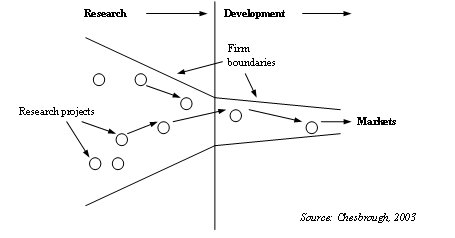 Traditionally, new business development processes and the marketing of new products took place within the firm boundaries (Figure 1). 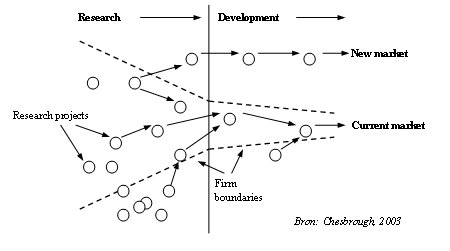 However, several factors have led to the erosion of closed innovation (Chesbrough, 2003). First of all, the mobility and availability of highly educated people has increased over the years. As a result, large amounts of knowledge exist outside the research laboratories of large companies. In addition to that, when employees change jobs, they take their knowledge with them, resulting in knowledge flows between firms. Second, the availability of venture capital has increased significantly recently, which makes it possible for good and promising ideas and technologies to be further developed outside the firm, for instance in the form entrepreneurial firms. Besides, the possibilities to further develop ideas and technologies outside the firm, for instance in the form of spin-offs or through licensing agreements, are growing. Finally, other companies in the supply chain, for instance suppliers, play an increasingly important role in the innovation process. As a result, companies have started to look for other ways to increase the efficiency and effectiveness of their innovation processes. For instance through active search for new technologies and ideas outside of the firm, but also through cooperation with suppliers and competitors, in order to create customer value. Another important aspect is the further development or out-licensing of ideas and technologies that do not fit the strategy of the company. Consider, for example, ASML, which is a Philips spin-off. combining internal and external ideas as well as internal and external paths to market to advance the development of new technologies. The smart people in the field work for us. Not all the smart people work for us, so owe must find and tap into the knowledge and expertise of bright individuals outside our company. We should control our intellectual property (IP) so that our competitors don’t profit from our ideas We should profit from others’ use of our IP, and we should buy others’ IP whenever it advances our business model. This means that within the company a shift should take place in the way people look at the company and its environment. Involving other parties when developing new products and technologies can be of great added value. Think for instance about cooperation with other firms in your sector, suppliers, universities, and of course end-users. The business model plays a crucial role in this is. After all, how and when external knowledge is required and used is to a large extent determined by the companies’ business model which describes how value can be created from innovations and which elements have to be sourced internally or externally. Reference: Chesbrough, H. (2003), “Open Innovation: The New Imperative for Creating and Profiting from Technology“, Harvard Business School Press.